The koji molds, A. oryzae and A. sojae, produce a wide assortment of enzymes. They are especially prolific at secreting proteinases, pepti-dases, cellulases, and amylases as they grow in the koji. 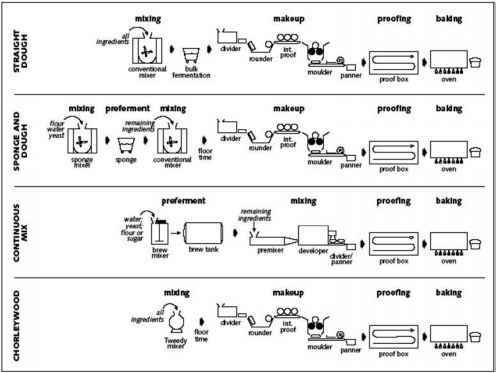 During the mashing step, these enzymes degrade soy (and wheat) proteins, starches, and other macromolecules to end products that are either necessary as nutrients or that can be fermented by the mash mi-croflora.As noted above,the actual amounts and specific types of enzymes produced by koji As-pergillus can vary, depending on the incubation temperature, strain, and substrate used during koji manufacture. In general, the lower the temperature, the greater will be the enzyme activity (within a range of 20°C to 35°C). Protein hydrolysis occurs via one of several different fungal proteinases and peptidases, each having specific pH optima and substrate preferences. In terms of enzyme activity, alkaline proteinase has more than ten times the activity of other proteinases. This enzyme is active between pH 6.0 and 11.0, although its pH optima is about pH 10.0. A semi-alkaline proteinase (pH optima 8.3), as well as at least two neutral- proteases and three acid-proteases (pH optima around 7.0 and 3.0, respectively), all contribute to hydrolysis of soy proteins. The peptides that are generated are further hy-drolyzed by peptidases that also have individual pH optima and are specific for particular amino or carboxy amino acid residues. Enzymes that release glutamic acid or that convert glutamine to glutamic acid are especially important, because this amino acid is responsible for much of the flavor-potentiating characteristics of the soy sauces. Salt-tolerance is another important property of koji pro-teinases, since they will still retain activity in the presence of high salt concentrations. A nearly complete hydrolysis of soy proteins is desirable, since the subsequent lactic acid and yeast fermentation, color and flavor development, and overall organoleptic quality of the finished soy sauce depend on amino acid formation during the mashing step. Most of the amylolytic activity present during mashing is due to fungal a- and p-amylases that effectively convert starch to simple sug-ars.Although some sugars are used to support mold growth, most remain in the mash where they will later serve as substrates during the fermentation stage of the process. This simple sugar fraction is comprised of several reducing sugars, including glucose and maltose, as well as xylose, galactose, and arabinose that are released from other polysaccharides present in the soy or wheat mixture (discussed below). The reducing sugars play an especially important role in color and flavor development, since they react with free amines during non-enzymatic browning reactions. The other main group of enzymes important during mashing are the cellulases, pectinases, hemicellulases, and other tissue-degrading en-zymes.They enhance extraction of substrates from the soy bean and wheat tissues, thereby increasing yield and nutrient availability. Formation of pentoses and other sugars also provide additional substrates for microorganisms and for browning reactions.